This board converts the proprietary Fanuc commutation encoder signals to industry-standard "Hall" signals compatible with most brushless drives such as Servo Dynamics, Copley Controls, AMC, and, of course, our own PWM brushless servo amplifiers. It uses the proprietary Fanuc signals until the motor has moved to the index pulse position for the first time, then it counts quadrature encoder signals after that for better precision of the commutation. It can accept encoder resolutions of 1000, 2000, 2500, 3000 and 10,000 cycles (pulses) /rev. The encoder resolution is set with jumpers. 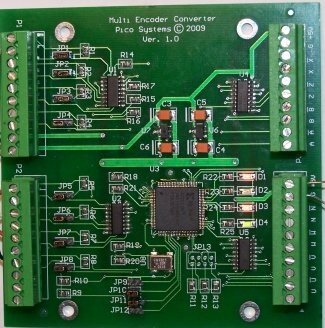 This board can also be used as a differential line receiver for the ABZ encoder signals, and repeats these signals for use by the CNC control and/or brushless drive.